This page is graphics intensive and loads slowly. Vertebrates come in all shapes and sizes, which means that vertebrate fossils can be found in all shapes and sizes, and some have their own specific field of study. One such specific field is that of anthropology. It is this field that has experienced popularity and notoriety. Magazines and television programs, especially specialized educational channels, have contributed to making this such a popular field. Jane Goodall, along with Louis, Mary and Richard Leakey, are among those who have received notoriety through their appearances in magazines and on television. An exciting discovery was that of the Australopithecus afarensis, called "Lucy", shown here. It was discovered by Donald Johanson in 1974, at Hadar, in Ethiopia. Its age is about 3.2 million years. Lucy was an adult female of about 25 years of age at the time of her death. About 40% of her skeleton was found. Her pelvis, femur (the upper leg bone) and tibia show her to have been bipedal. She was about 107 cm (3'6") tall (small for her species) and about 28 kg (62 lbs) in weight. Australopithecus afarensis existed between 3.9 and 3.0 million years ago. Afarensis had an ape like face with a low forehead, a bony ridge over the eyes, a flat nose, and no chin. Afarensis also had protruding jaws with large molar teeth. The cranial capacity varied from about 375 to 550 cc. Except for the more human like teeth, the skull is similar to that of the chimpanzee. The canine teeth are much smaller than those of modern apes, but larger and more pointed than those of humans, and the shape of the jaw is between the rectangular shape of apes and the parabolic shape of humans. However, their pelvis and leg bones more closely resemble those of modern humans, leaving little doubt that they were bipedal. Afarensis had a brain capacity that varying between 380 - 450 cc. Their bones show that they were very strong physically. Heights varied between about 107 cm (3½ feet) and 152 cm (5 feet). Males and females show a considerable difference in size, varying from 1 - 1.7 m in height and from 25 - 50 kg in weight. This is a condition known as sexual dimorphism, and in this case, females were substantially smaller than males. The finger and toe bones are curved and proportionally longer than in humans, but the hands are similar to humans in most other aspects. Most scientists consider this as evidence that afarensis was still partially adapted to climbing in trees, while others consider it just an evolutionary remnant. The "Turkana Boy", a Homo erectus, was discovered by Kamoya Kimeu in 1984. It was discovered at Nariokotome, near Lake Turkana, in Kenya. 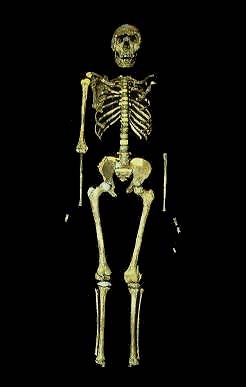 This is an almost complete skeleton of a young boy somewhere between the age of 11 or 12 years old, and with the only major omissions being the hands and feet. Some scientists believe Homo erectus matured faster than modern humans and that this Homo erectus was really about 9 years old. It is the most complete known specimen of Homo erectus discovered, and also one of the oldest, at 1.6 million years. The brain size was 880 cc, and it is estimated that it would have been 910 cc at adulthood. The boy was 160 cm (5'3") tall, and would have been about 185 cm (6'1") as an adult. This is surprisingly tall, indicating that many Homo erectus may have been as large as Homo sapiens. Except for the skull, the skeleton of this young Homo erectus is very similar to that of modern boys, although there are a number of small differences. There are those who do not believe in evolution or in Darwin's theory of natural selection. There were those that believed that the earth was flat and that a ship would fall off the earth if it sailed too far. There were those who believed that all the other planets revolved around the earth. So, alternate theories and debates are nothing new. However, it proved to be fatal for Socrates. Athenians, sitting on a council in 399 BC, ordered his death for his teachings that supposedly corrupted his students. Below is yet another debate for you to think about. Another important and famous fossil discovery was that of Archaeopteryx. There have been 8 specimens of Archaeopteryx found, with 7 actual specimens and one feather. The image we have provided for you above is that of Archaeopteryx lithographica, meaning "ancient wing from the printing stone", and it was named after the limestone in which it was discovered. The stone is a smooth, fine grained limestone which was used in printing. This stone is quarried in and around the Solnhofen area of Germany. It formed on the bottom of a hypersaline lagoon in the Late Jurassic, about 140 million years ago. 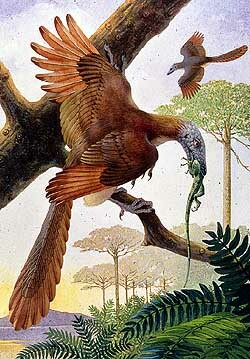 It has long been accepted that Archaeopteryx was a transitional form between reptiles and birds. Lately, scientists have realized that it even has more of a resemblance to its possible ancestors, the Maniraptora, than to modern birds. Is Archaeopteryx an earlier ancestor to modern birds and related to dinosaurs? The debate still continues, since there have been no fossil discoveries to date showing evolutionary examples between dinosaurs and Archaeopteryx. One study, based on the belief that animals sharing a common ancestry exhibit common features during embryonic formation, found a surprising result. If birds are related to dinosaurs, there should be evidence in bird embryos of a thumb remnant, as dinosaurs had such. However, in the microscopic examinations of the stages of development in the embryos of birds, the embryos showed no vestige of a thumb that is present in primitive form in dinosaur fossils. Yet there are dinosaurs that had wishbones, three toed feet and cranial air sacks, all distinctive bird-like features. 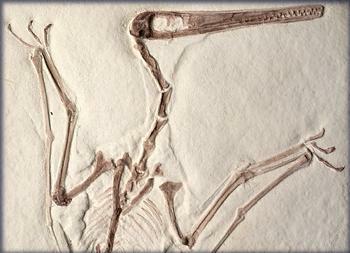 It is now thought that even pterosaurs had hollow bones, yet one more characteristic similar to birds. Unlike all living birds, Archaeopteryx had a full set of teeth, and a rather flat sternum, or breastbone. It had a long, bony tail, and belly ribs called gastralia. It had three claws on the wing which could have still been used to grasp prey or possibly trees. However, its feathers, wings, furcula (wishbone), and reduced fingers are all characteristics of modern birds. Archaeopteryx certainly had feathers, as shown in the image above, which was the first fossil evidence found of an Archaeopteryx. Whether these feathers were used for regulating its body temperature or for flight has not been determined. Feathers may have originally evolved for insulation, leading later to flight. The origin of flight, and the actual flight capabilities of Archaeopteryx, are still being debated as well. Archaeopteryx had a comparatively flat sternum. 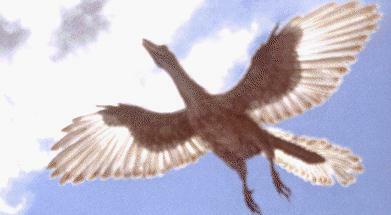 Although it is currently thought that Archaeopteryx could possibly fly, it was probably not a strong flier. It may well have ran, leaped, glided, and flapped all in the same day. Is Archaeopteryx truly a flying theropod? It shows virtually no avian characters not observed in other theropods, with the large, distal, fully reversed hallux may be the only exception. Is Archaeopteryx a theropod, and also a dromaeosaur, because it shares a number of detailed characteristics only with dromaeosaur? Some other characteristics are found only in the two forms and in some basal birds. Could Archaeopteryx have been capable of flight like the example of the modern bird above, or did it have to glide, as is thought in one theory concerning pterosaurs? Click on the image of the pterosaur above to see an example of how it might have been capable of flight. Added to this debate are the pterosaurs mentioned above. The pterosaurs were a diverse group of flying reptiles found all over the earth during the reign of the dinosaurs. 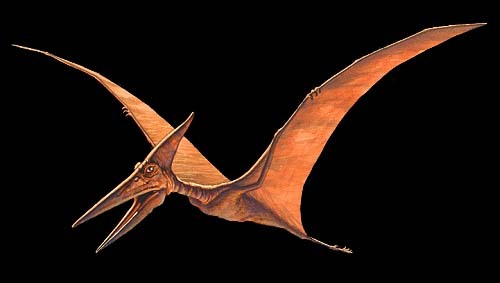 Pteranodon, shown in an image above, was a large pterosaur with a wingspan well over twenty feet. Pterosaurs were clearly thought to big and heavy to have the capability of flight but research is proving that pterosaurs had hollow bones, large brains with well developed optic lobes, and several crests on their bones to which flight muscles attached. All of this is consistent with powered, flapping flight. The most commonly known pterosaur, and a Hollywood favorite, is that of the Pterodactyl. It is seen in an image above. To see examples of what vertebrates were found during archaeological excavations we have been present at, but with such examples not necessarily fossils, click on the image below.